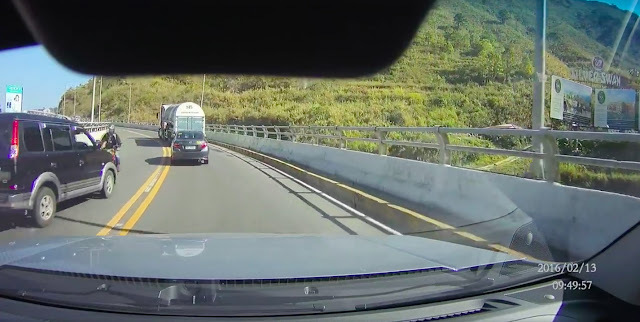 MANILA, Philippines- A video of a freak accident involving a motorcycle and a Mitsubishi Adventure along the Marcos Highway flyover in Baguio City which took place on on Saturday, February 13 has gone viral. In a viral dashcam video shared by netizen Leo Kimbungan on Top Gear Philippines, a Mitsubishi AUV was spotted overtaking on the left lane on a yellow double line. Unfortunately, a motorcycle speeding away on the opposite lane had a head-on collision with the Mitsubishi vehicle since the latter overtook on a blind curve. As a result of the reckless move of the Mitsubishi AUV driver, the driver of the motorcycle was sent flying into the air over the AUV then fell flat on the concrete. During the duration of the footage, the driver seemingly looked lifeless as it lay still on the road. However, a certain Carlo Bueno, who is apparently a staff at Baguio General Hospital where the driver was brought, said that the motorcycle driver survived the mishap and only sustained an open arm fracture. The video has amassed over 1 million views and almost 30,000 shares as of press time. According to an article by Top Gear Philippines, a double yellow line signifies a no-passing zone. This means that motorists are strictly prohibited from overtaking or counter-flowing as doing such will highly lead into an accident. This road marking is often seen on blind curves and on bridges.